Homemade Natural Root Concealer Stick - Oh, The Things We'll Make! 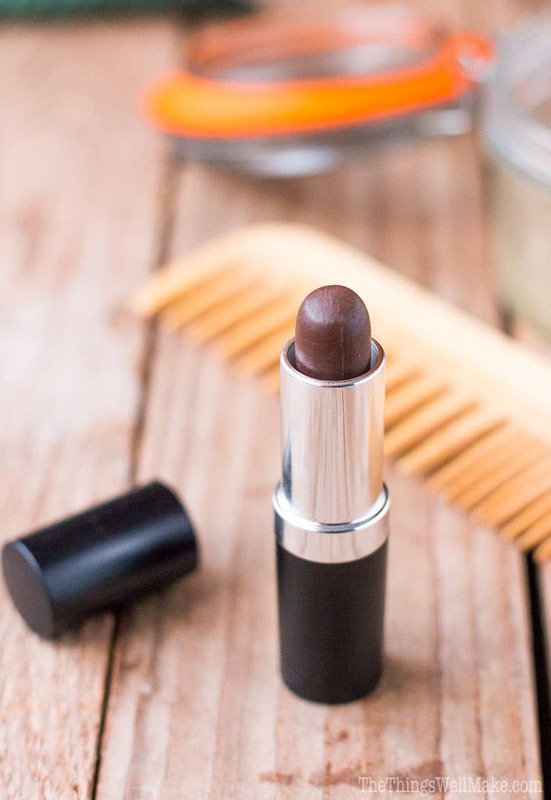 Cover up those gray hairs or dark roots with a simple, easy-to-make, homemade natural root concealer stick which won't break the bank, at all. Lately I've been dabbling a lot more in the world of natural DIY products. When I started this blog, it was a lot more about fun DIY projects for kids with a few healthy (and other) recipes sprinkled in. As I started trying to get healthier and more in shape, my posts got more focused on healthy alternatives to fun foods with some DIY sprinkled in. My son, for now, likes to help me cook, but doesn't show my interest in making things, which is part of the reason that my DIY has gotten a lot more adult and focused on simple, green DIY that you can make for your home & body. 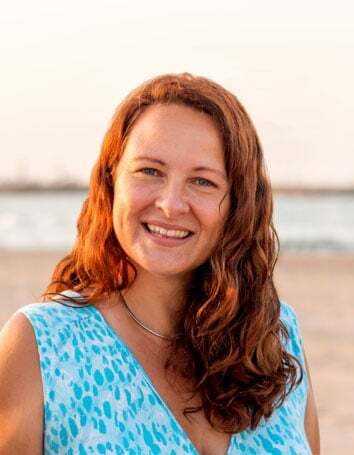 Back when I started my blog, I had already thrown out a lot of cosmetics with toxic or questionable ingredients, but I didn't share much of what I was using because most of the time it was as simple as sleeping with coconut oil on my hair, or rubbing in some jojoba oil on my face. I mean there wasn't a lot to tell, until my formulas got a bit more sophisticated. While this homemade natural root concealer stick isn't something that I need to use every day, I'm pretty much as excited about it as I was when I came up with my favorite deodorant recipe. Because it's super simple and inexpensive to make, it solves a problem I couldn't solve with anything I could find around here (toxic or not), and it actually works! The left side has already been covered with the stick, and I'm just starting to cover the roots on the right side. …Until my roots start showing, of course! A few years back I had found a root concealer stick at a store in the US, and it worked pretty well to camouflage the slight difference in color between my natural color and my dyed hair. Unfortunately, it had a bunch of crazy ingredients in it, and I haven't been able to find anything like that around here anyway. What if I were to take the leftover eyebrow pencil ingredients and rub it on my exposed roots? I was super excited, and mixed up a new batch and poured it into a lipstick mold. I had just bought the lipstick mold to do some experiments with homemade lipstick and concealer stick recipes, but I would have never thought I was going to use it for something for my hair. 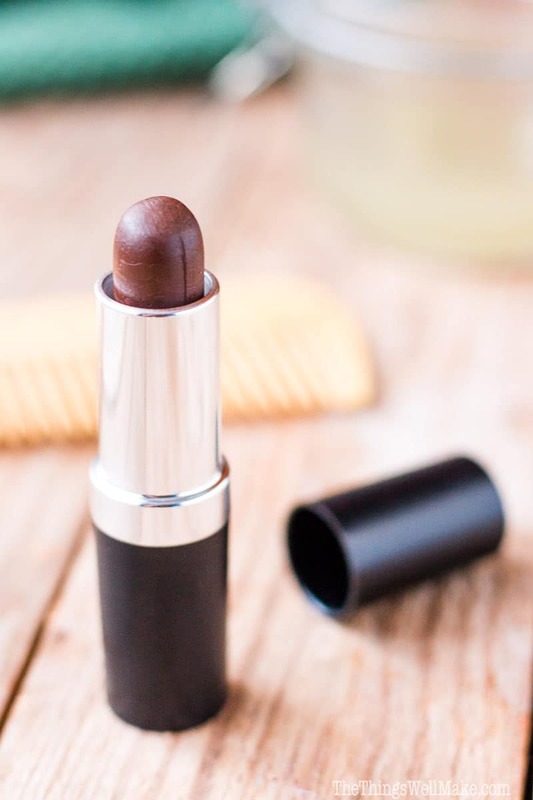 I love the professional look the lipstick mold and cases give to this homemade natural concealer stick, but if you don't have them, and don't want to buy them, I'm assuming that this will work just as well in easier to find lipgloss cases. While it may be hard to see, I've tried to show you some before and afters both in pictures and in a short video that shows the process of making the concealer stick and how I used it. I rub the concealer stick lightly over the roots in the morning, and it does a good job of camouflaging them all day without any problems. So, now I can put off touching up my hair for a bit longer. Another attempt at a before and after picture. I was pretty lucky, and I think my first attempt at getting the color right for me turned out perfectly. I used a 50%-50% mixture of black and brown iron oxides for my pigments. If you have a redder tone to your hair, you can try adding a tiny pinch of red iron oxide, and if your hair is more golden, you can play with a yellow iron oxide pigment instead. Don't get too caught up in trying to make something that looks EXACTLY like your hair, though. 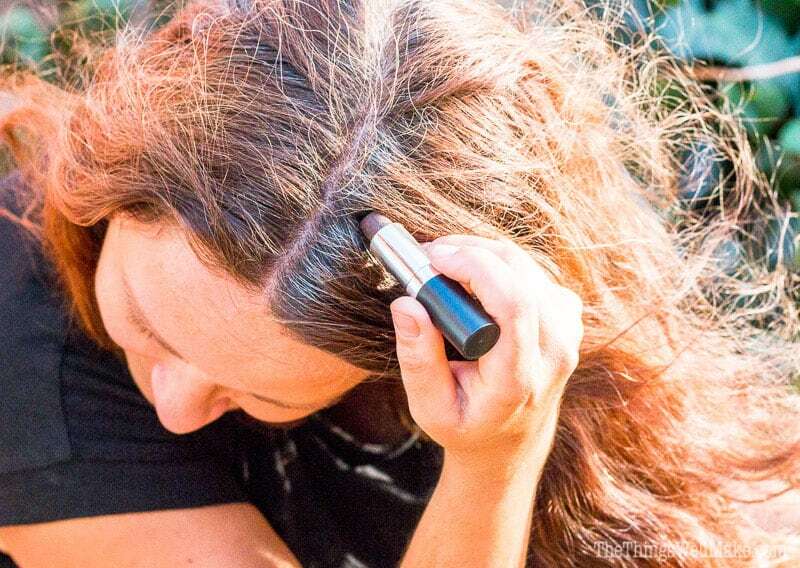 While this is covering your hair in an opaque enough way to mostly cover your gray hairs and/or darker roots, it blends in enough that it doesn't stand out if the color is slightly off. Think about it, your roots tend to be a bit darker naturally anyway, and the rest of your hair slowly lightens as it is constantly hit by the sun. Your hair has different tones in different areas, and all of that helps make this stick look very natural when in place. Luckily, the ingredients for this aren't that expensive, and you use very small amounts when formulating a stick that should last you for quite a long time. Take your time measuring out your pigments the first time you make this, and write down your personal successful mix formula for your next batch. Because this recipe uses such small amounts of ingredients, I had to invest in a new scale that weighed smaller amounts much more accurately than my kitchen scale could. Luckily, I found a very inexpensive jeweler's scale that didn't break the bank, and I can now use it for making all sorts of homemade makeup. Let's make a Homemade Natural Root Concealer Stick! Cover up those gray hairs or dark roots with a simple, easy-to-make, homemade natural root concealer stick which won’t break the bank, at all. Melt together all of the ingredients, except the iron oxide pigments, over a double boiler until melted. Combine everything together, stirring well, and slowly adding in the iron oxide pigments until you get a color that works for your hair. In my case, I added around 50% brown and 50% black iron oxide pigments, and it works very well for my color, but you may have to play with using yellow and/or yellow iron oxide pigments too to achieve the right color for you. Prepare the lipstick mold, if you're using it, by putting together both halves, and holding them together with rubber bands. As the mixture cools, it tends to make a bit of a hole in the center, which is why it's a good idea to pour in a bit more of the mixture than what you need to get to the top of the stick part of the mold. You'll be cutting off the excess product anyway. To help make the unmolding quicker and easier, you can place your filled lipstick mold in the freezer for a few minutes. 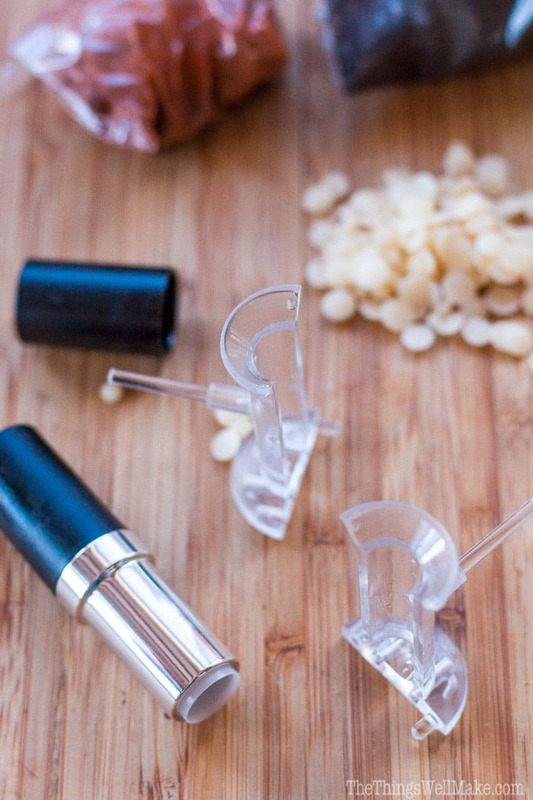 Take the rubber bands off the lipstick mold, and pull both halves apart. Remove your homemade concealer stick. Cut off any excess product from the base of the concealer stick. Carefully push the product into an empty lipstick container, and you're done! You now have a professional looking homemade natural root concealer stick! 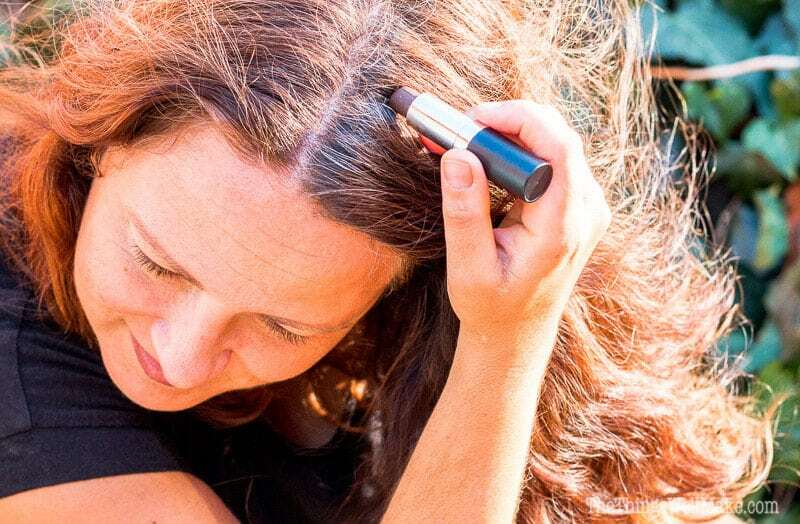 Lightly rub the concealer stick over the roots of your hair until any dark roots or gray hairs have been camouflaged. You can try rubbing the stick over the hairs in different directions to get them covered equally. I’m so glad I found your recipe! By the way, can I use coffee powder instead of iron oxide powder? Thank you so much! Loves and hugs! While you could try it, I’m afraid that I doubt it would have good coverage. The main problem is that it’s probably impossible for most people to grind it fine enough to get it to disperse well in the product. I’ve tried with very fine powders, but they often clump up in this sort of product. Not only that, but coffee is pretty hard and abrasive. Something like cocoa powder is more likely to work, but I’m still not sure about the coverage that it would give. Plus, you have a lot less flexibility with mixing colors. Hi Tracy, Thank you for your reply earlier. I decided to try to do this. I found all the ingredients in smaller contents in my country, except the mold. Do you think a kitchen digital scale would make it or do I need to bye a special scale? It has grams, but maybe you found out its not precise anyway?.. Thank you for posting this recipe. I am exited to try it out. I’m so happy to hear that you are going to give it a try. I have 2 scales that I typically use. One is a normal kitchen scale, and the other is a jeweler scale for items that need to be measured in smaller quantities. They are both really inexpensive, so if you plan on making your own products in the future, I do think it’s a good investment to make. Carnauba wax is harder than beeswax, so if you want to harden your stick more, you can add more of that. 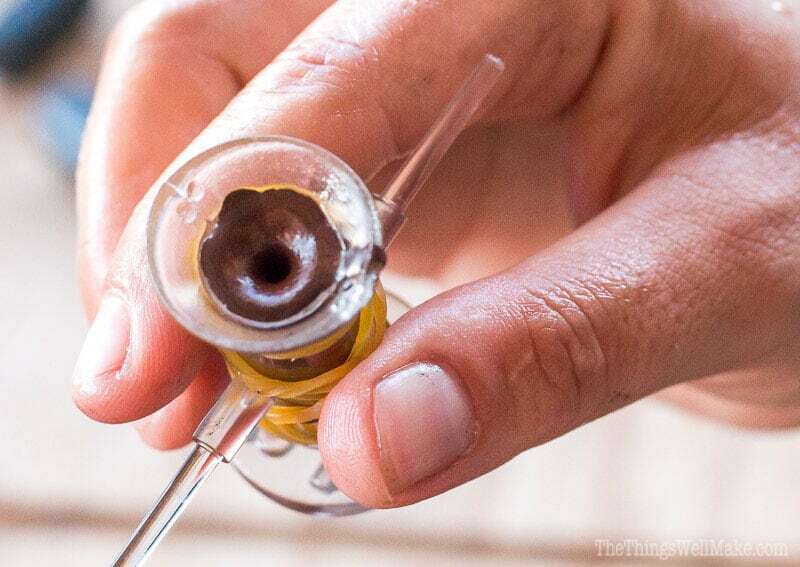 If it’s too hard, you can add a few drops of oil. Where can I purchase Natural hair color stick in dark brown. I’m sorry. I don’t sell my products. I show people how to make their own! I wish I could recommend a particular one, but I’m not really familiar with the ones on the market right now. I would play with using titanium dioxide or zinc oxide. They are usually what is used to lighten up the other colors when needed. Titanium dioxide tends to make a brighter, more opaque white than zinc oxide, so you probably wouldn’t need as much of it. You can see that I played with titanium dioxide when I made homemade Halloween makeup. It’s a similar type process. Hello, I have chemical sensitivities and have been shopping for a natural ‘gray hair ‘ cover stick. This sounds great but when I added ingredients to my cart on Amazon, I am up to nearly $30. Do you make and sell coversticks? I’m thinking it may be cheaper than creating my own. I have a lot of oils and waxes on hand because I make a lot of lotions, lip balms, etc., but I understand that if you don’t normally DIY stuff, that the ingredients could add up. My guess is that you could get away with using a higher amount of beeswax and ditching the carnauba wax, for example. Carnauba wax is harder than beeswax so it helps give staying power, and you need less of it that beeswax. You could potentially save money there if you don’t think you’d use the other wax in other products. As for the oils, you could probably get away with using only one of them too. Jojoba oil is liquid, so it would need more wax. Shea butter is more solid, so you’d probably need less. You could definitely play with the ratios to get the right texture. Hello, what size weight scale and double broiler did you use to make the root cover up stick? The scale measures to the hundreths place, and is small and inexpensive. I use it for all of my lotions, conditioners, etc. How long does the color last in your hair? Is this temporary/ apply daily? I am excited to get the ingredients and make this! It’s just a touch up stick, sort of like a “crayon” of sorts, so it will mostly wash out when you wash your hair again. I don’t wash my hair daily, so it usually lasts me longer than just daily for me, but you can easily touch up your hair as needed if some of it does wear off.